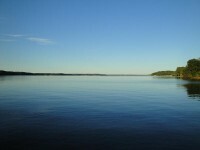 The territory embraced in Limestone County was at one time in the large domain on the Tennessee River, that was claimed by both the Chickasaws and Cherokees. There is no record of any settlement ever having been made, within its borders by either nation. Both however made cession of it to the United States. It was embraced in the Cherokee cession of January 7, 1806. From this cession, the Cherokees reserved a tract which embraced that part of Limestone County west of Elk River. This land was given over to the United States by the cession made in the treaty of July 8, 1817. On September 20, 1816, the Chickasaws, ceded to the United States, with the exception of three reservations, all right or title to lands on the north side of the Tennessee River. 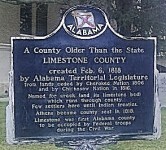 Limestone County was created by an act of the legislature February 6, 1818. It was formed from land lying west of Madison County, north of Tennessee River, and east of the western boundary line of range six, west of the basis meridian of the county. An act of the legislature of November 27, 1821, gave to this county all of the country belonging to Lauderdale County, in the fork of the Tennessee and Elk Rivers, east of range six. The name of the county comes from the large creek which flows through it, whose bed is of hard limestone. In the extreme northern part of the state, Limestone County is bounded on the north by the Tennessee state line, on the east by Madison County, on the south by Morgan and Lawrence Counties, and on the west by Lauderdale County. John Craig, of Tennessee, made the first attempt to settle in this county about 1800. Camping three days above the big spring at Athens, and not liking the temper of the Indians he broke camp and returned to Tennessee. By a treaty with the Chickasaws July 23, 1805, a triangular tract of country in Alabama, north of the Tennessee River, was acquired, which in 1808 was created into Madison County. By the treaty of January 7, 1806, the Cherokees ceded to the United States, all their lands in Alabama, with the exception of two reserves, north of the Tennessee River, and west of the Chickasaw Old Fields. This cession, of course, included Madison County. 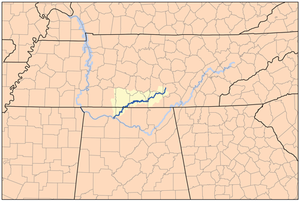 The claim of the Cherokees was not admitted by the Chickasaws, nor by the United States, which in spite of the Cherokee cession, continued to recognize the Chickasaws’ property right to the tract which they had ceded, and their claim to all the rest of the land north of the Tennessee river, west of this cession. 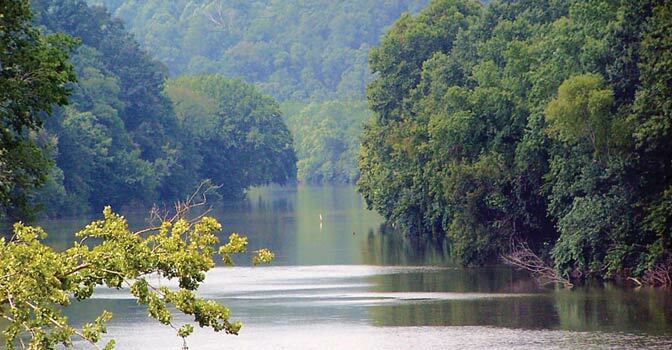 The islands in the Tennessee river nearly all show evidence of Native American occupancy and those located in Limestone County are no exceptions. On Elk River and Limestone Creek are further evidence. Near Brown’s Ferry, a property of the Henry Warten of Athens was a large townsite. On the upper end of Mason Island is a small townsite, which investigations have shown to contain numbers of burials, accompanying which were copper coated objects of wood used for ear pendants, and some earthenware of a very interesting design. On the property of Arthur Steel (ca. 1921) near the landing is a domiciliary mound 12 feet high. Nearby is a smaller one, probably a burial mound though no investigation of it has been attempted. 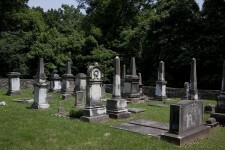 On the plantation of J. E. Penney of Birmingham, is a cultivated field, one and a half miles back from the union of Limestone Creek with Tennessee River is a burial mound. 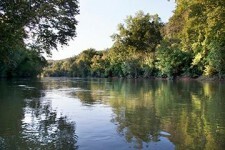 In 1807, a party consisting of Thomas Redus, William Redus, William and James Simms, James Withy, John Maples, Benjamin Murrell, and one Piedmore came from Roane County, Tenn., in flats down the Tennessee River, to the mouth of Elk River, and thence up this stream to Buck Island where they landed. 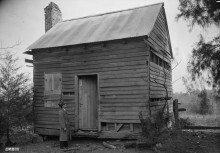 After prospecting for a few days the party moved out to form their settlement and on October 3, the first cabin was erected, this cabin was for the Simms brothers and hence the community became known as Simms’ settlement. This was the first white settlement in what is Limestone County. The year 1808 saw the advent of many others in the county, nearly all of whom settled on Limestone Creek. In the fall of the same year, another settlement was made on Limestone Creek, a few miles above Mooresville, by John James and Joseph Burleson. Mooresville took its name from Robert and William Moore who were its first settlers and is the oldest incorporated town in Alabama. Mooresville has connections to two US Presidents. Samuel Robertson settled in 1808 on the present site of Athens, where he established a trading house, and for two years carried on a considerable business with the white people and Indians. Thomas Redus built the first grist mill in 1808. About 1810 one was built in the fork of Piney about a mile and a quarter above Mooresville, and about the same time, one was built on Round Island Creek. After the treaty made with the Chickasaws, July 23, 1805, Governor Williams issued a proclamation forbidding immigrants to settle outside of the ceded territory. His proclamation was disregarded, and all settlers in Limestone County from 1807 to 1816 were, in fact, intruders on forbidden land. There was more or less friction between them and the thin band of Chickasaws, who made their homes in the county. By 1809 the complaints of the Indians had become so persistent that Col. R. J. Meigs was ordered into the county with a small force to protect the Indians and exercise a general supervision over the county. Col. Meigs established himself at Fort Hampton, a post which he erected on Elk River seventeen miles from Athens. He was a discreet man and was successful in his dealings with the rough frontiersmen under his control. He drove from the county all those who had settled on lands claimed by or cultivated by the Indians. Others, whose presence it seems was not objected to by the Indians were allowed to remain. Thomas Redus was allowed to remain and operate his mill for the benefit of soldiers and Indians. 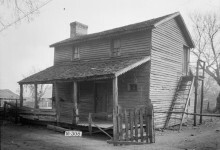 Robertson was removed from his trading post, and a man named Wilder put in his place, and the post was made a stopping point between Fort Hampton and Huntsville. The services of the soldiers were used in opening roads, and they built one from Fort Hampton to Athens, and thence assisted by some of the Huntsville garrison, it was extended to that place. What was known as the “Township Road,” from Huntsville to Brown’s Ferry was the work of the Huntsville garrison. 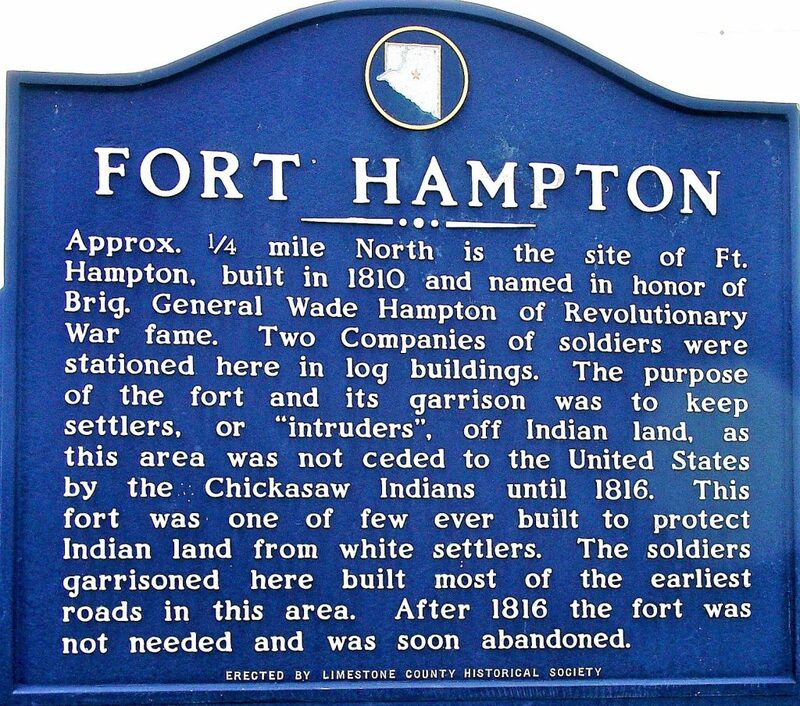 In 1810 the opening of the road from Mooresville to Elk Ferry on Elk River was the work of the Fort Hampton garrison. The first white child born in what is now Limestone County was Robert Pridmore in May 1808, five miles above Athens, followed by the birth of George Witty in the following November, seven miles north of Athens. Robert Bell, a Cumberland Presbyterian minister, in 1809, was the first to preach the gospel in Limestone County, the home of Jonathan Blair in the fork of Big and Little Piney being one of his appointments. He kept regular appointments even after most of the squatter population had been driven out. In 1810 other Cumberland Presbyterian ministers entered the field, followed shortly by Methodist ministers, as well as those of other denominations. 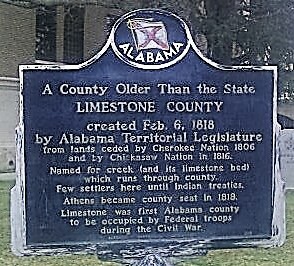 The legislature passed an act on November 17, 1818, ordering an election to be held in the courthouse in Athens on the fourth Monday in March 1819, for the purpose of electing five commissioners, who should have the power to select a proper place for the seat of justice in the county; and all free men in the county were entitled to vote. The act further gave power to the commissioners to be elected, the power to contract for and receive on behalf of the county a good and sufficient title to four acres of land for the purpose of erecting a courthouse, a jail, pillory, and stocks for the use of the county. Power was also given to build a courthouse and other necessary buildings. The location of the courthouse was an all absorbing question in the election of the commissioners. Three places were nominated, Athens, Cambridge, and English’s Springs. After an exciting contest, Athens was selected, the men who were running on her part were Reuben Tilman, Thomas Redus, Jeremiah Tucker, Robert Pollock, and Samuel Hundley. 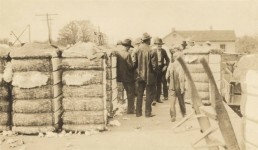 Setting about their duties immediately, they secured from Robert Beaty, John D. Carroll, John Coffee and John Reed, the ground now covered by the public square in Athens, on which the public buildings of the county were established. Revised to July 1, 1919, from U. S. Official Postal Guide. The number indicates the number of rural routes from that office. 1819—Thomas Bibb; Beverly Hughes; Nicholas Davis. 1861—Joshua P. Coman; Thomas J. McClellan. 1865—Joshua P. Coman; Thomas J. McClellan. 1901—W. T. Sanders; Erie Pettus. 1851-2-Nathaniel Davis; Nicholas Davis, J. 1876- 7—Gaines C. Smith; B. M. Townsend. 1878-9—W. R. Crutcher; L. R. Davis. 1880-1—J. G. Dement; C. P. Lane. 1882-3—Porter Bibb; C. W. Raisler. 1884-5—J. H. Hundley; W. W. Hill. 1886-7—W. E. Vasser; W. R. Crutcher. 1888-9—Benj. M. Sowell; A. W. Mosely. 1890-1—H. D. Lane; J. B. Townsend. Once Alabama was admitted as a state of the United States of America on December 14, 1819, a great wave of immigrants from other states and countries came by flatboats, pack-horses, covered wagons and ships to become the first citizens of the state. Are these structures still standing today or some of them. At the end of article in the sources part of the article it gives the wrong date we became a state. December 4th, 1819 is not correct. Thanks for correcting my typo. It should have been Dec. 14, 1819. The John Craig mentioned in this article is my ggggrandfather.